Getting your antenna in the air can sometimes be challenging. Not all of us have unlimited real estate and 120 foot towers at our disposal to hang any radiator on that we please. We all have to work within the confines of our situation, meaning limited space, property restrictions, access, or even budget. Thinking about those situations, here’s some creative ideas for mounting your antenna that work well in limited spaces or modest budgets. A portable base can run the range of a spike or peg that you pound into the ground to a wooden frame that’s moveable. 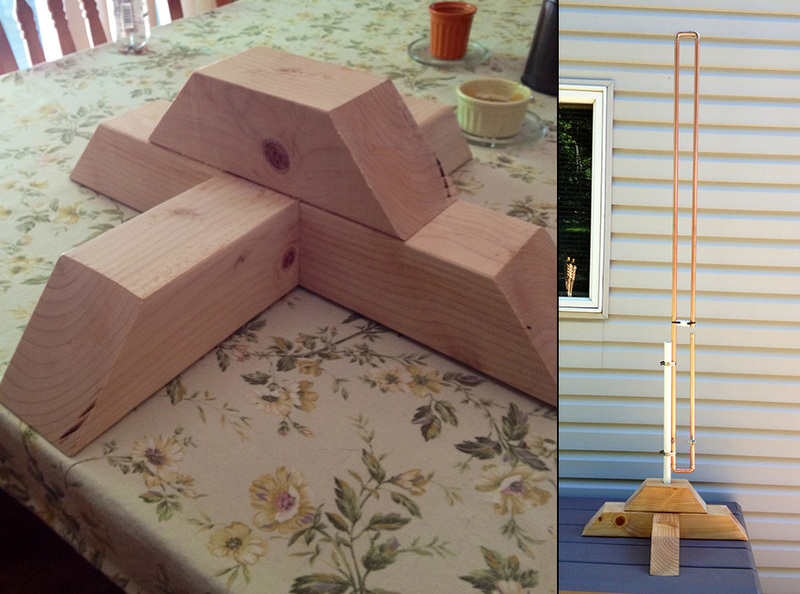 One such user built a heavy base out of 4×4 lumber for his Slim Jim Antenna. This type of base would look nice in the corner of your apartment or sitting out on your exterior patio or deck. Giving the base a nice coat of stain and lacquering the antenna would certainly turn the entire piece into a decorative art project. A simpler approach to the wooden base is one built out of PVC tubing. You can build a lightweight base for your antenna out of 1 inch Schedule 40 PVC and a few t-connectors. Total cost: about $5.00. A dab of PVC cement in the connectors will keep the base from falling over due to the weight of the antenna. Speaking of decorative art projects, many apartments don’t allow antennas or similar devices on balconies. 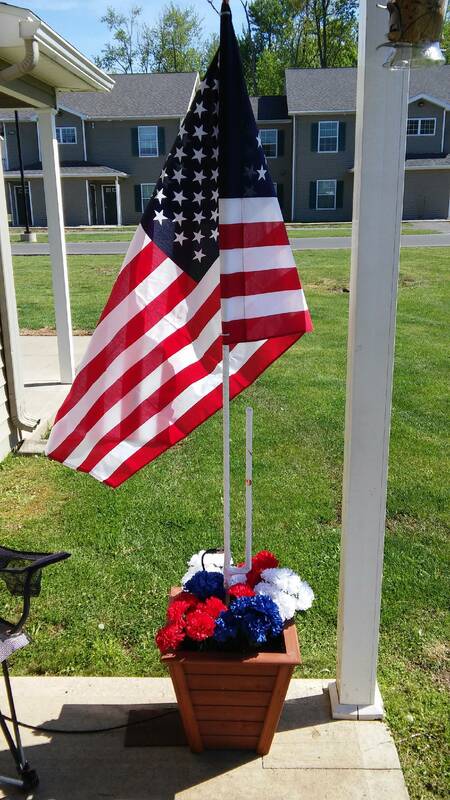 But you can put out flowers and plants. Why not ‘plant’ your antenna in a large flower pot filled with landscape stone and disguise the antenna with some plastic plants or vine. As long as the plastic flowers don’t have metal wire in them, their presence shouldn’t affect the SWR of your antenna. Plus getting your antenna outside will increase its performance greatly than if it was sitting inside your apartment. A fencepost or a deck railing makes an excellent antenna support. These sturdy posts and railing are just waiting for antenna to be mounted on them. I use one of the posts on my six foot privacy fence just for that purpose. By attaching a 10 foot piece of 1 inch EMT conduit to the fence post, I have an effective mast and support for my Slim Jim antenna. 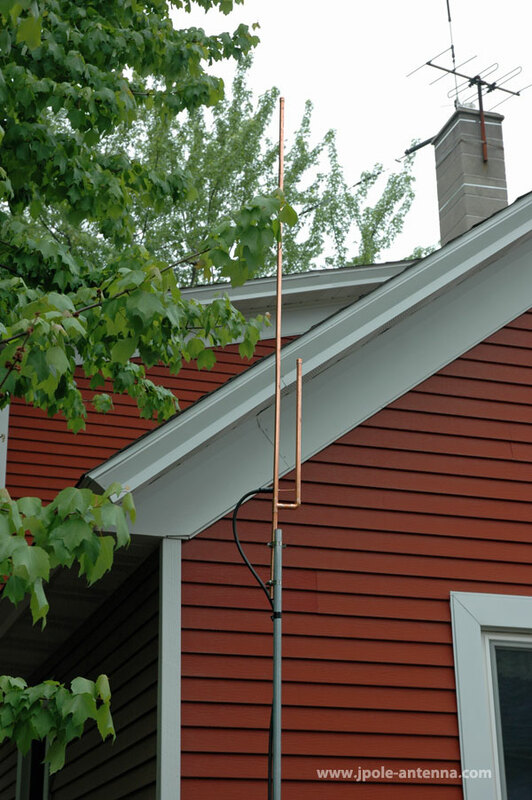 Using the existing structures of your house, garage, or utility building are great spots for antenna. Chimney strap kits, commonly used for television antennas, are sturdy enough for a VHF/UHF vertical antenna. Just make sure your chimney is structurally sound to attach the straps to. If you don’t have a chimney, bathroom vent pipes are another great choice. A roof peak mount, another television antenna mount, also works well to support vertical antennas. I use one on the end of my detached garage to support my HF wire dipole antenna. Installing this mount require drilling four heavy lag screws into your houses fascia, but it is a durable option. Mine also serves double duty of hosting a bat house. This duplex has three mounts installed on the side of the house. Two are unused and one (possibly) still in service. 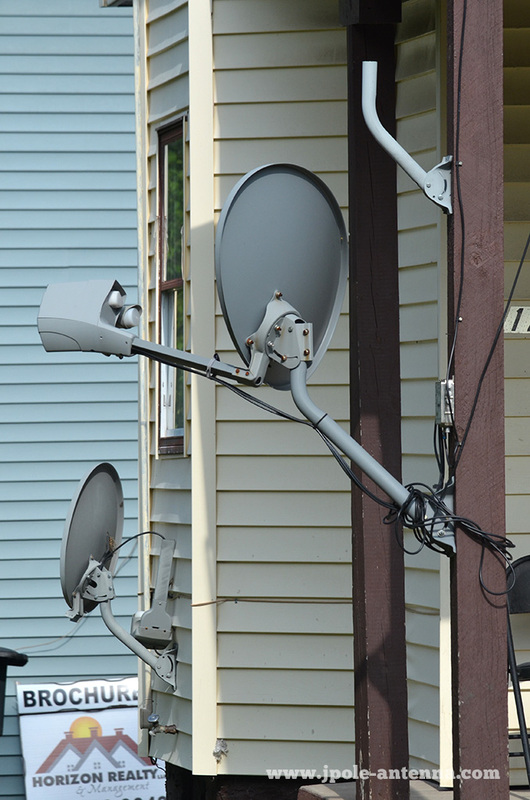 The J-mounts used for the small direct broadcast satellite dishes are a great as an antenna support. Take the dish off the mount and you’ve got enough space to mount a vertical antenna to the short mast. Even if you are still using the satellite dish, you can use a short piece of pipe to extend the mast and mount an antenna above the dish. 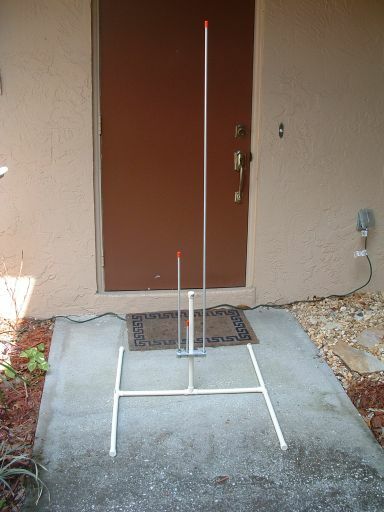 Integrating your VHF antenna with the satellite dish is a great way to disguise your antenna from curious eyes that might not otherwise appreciate the beauty of amateur radio antennas. More ideas on using satellite dish J-mounts can be found on this previous blog post. Space permitting, the attic is an excellent location for an antenna. Attic antennas have a couple of benefits compared to mounting an antenna outdoors: primarily it allow you to be totally stealth, which is important if you live in a neighborhood that restricts outdoor antennas. Also the attic will protect your antenna system from lightning strikes. I know of hams that will run a totally independent antenna system in their attic so that they can still be on the air if they take their outside antennas offline due to thunderstorms. But an attic mounted antenna does have its caveats. First, metal roofs and mylar backed vapor barriers will impede your signal and antenna performance. If you house has a metal roof, the attic will probably not be an option for you. Another is space. 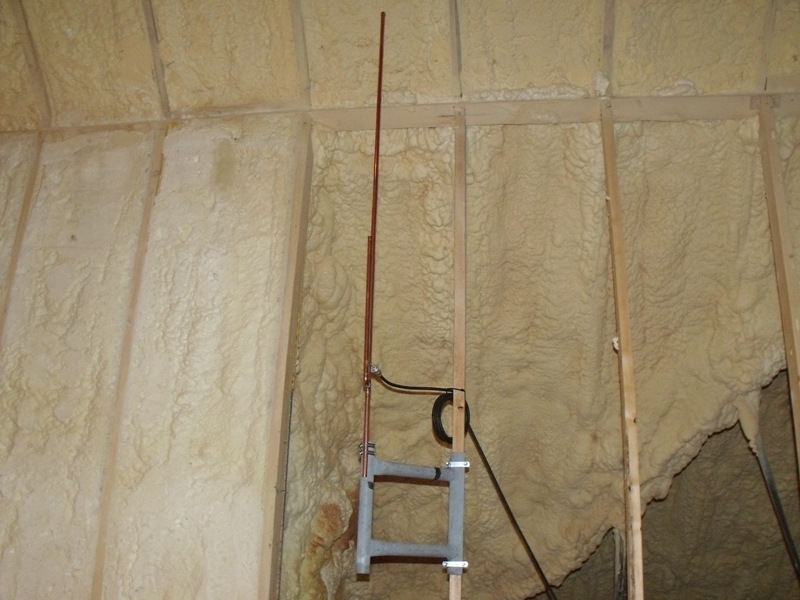 If you can stand up at the peak of your attic, then you will probably have enough room to mount a vertical antenna. But if your clearance is less than six feet, then a vertical antenna is going to be a challenge- although you still may enough space for a shortened dipole antenna for the HF bands. With mounting antennas in and around your house, RF radiation safety needs to be observed- especially if the antennas can be touched in their mounted locations. The FCC’s OET Bulletin 65 is full of charts and formulas for you to make RF radiation assessment. The good news is that if your transmission duty cycle is sporadic and you keep your power below 50 watts for VHF/UHF frequencies, your exposure will be minimal. For more information on RF safety, read this article from my blog. You don’t need a large tower to enjoy amateur radio- just about any antenna support will get you on the air. With so many different options and mounting solutions available, I’m sure there is something that will fit your needs and budget. Do you have a unique or different antenna mounting solution? Please feel free to share it in the comments below. Getting your antenna in the air can sometimes be challenging. Not all of us have unlimited real estate and 120 foot towers at our disposal. 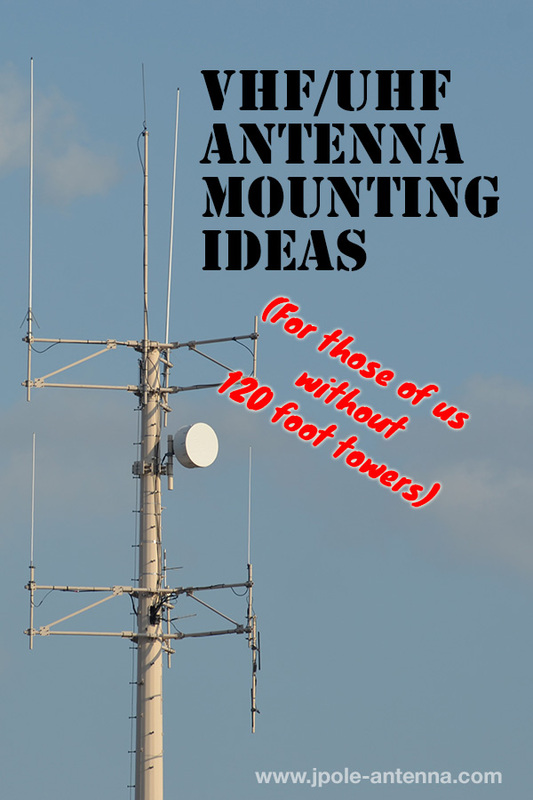 Here's some creative ideas for mounting your antenna that work well in limited spaces or modest budgets. Being on temp disability from work allowed me time to find your antennas. As soon as I return to work I will definitely purchase one for HF/VHF/UHF scanning. They are so beautiful that I plan an indoor mount! Have you tried building a version for Citizen’s Band? In my area there’s a good group of people getting back in the hobby (especially on 27.385 LSB) and spending a good bit of money on equipment. Many of these folks were teenagers during the CB rage in the 1970s, however now they have the money to spend for systems rarely seen forty years ago. I can’t recall a dipole or ground-plane antenna with such quality and performance currently available for the 10m-12m bands. Being an operator I’m sure your gain claims are realistic. I will be taking my Tech exam this month and look forward to using my privileges. If not for CB and updated technology I may have never wanted my “ticket”. Michael thanks for the work you’ve done in the hobby and I look forward to owning such a beautiful piece of technology.